You can use SSL certificates with Address Book, web, e-mail, iCal, and iChat services in Lion Server to encrypt data sent between clients and the server. To create an SSL Certificate signed by a trusted certificate authority, you will submit a certificate signing request and then import the resulting certificate. Select the server in the left column under Hardware and click the Settings tab. Click the Edit button next to SSL Certificate. Click the Actions menu (gear icon) below the list of services and choose Manage Certificates. Click the Actions menu in the dialog that appears and choose Generate Certificate Signing Request (CSR). A signing request is generated and displayed in a new dialog. A Save As dialog asks you to pick a location on the hard drive. You can send this file (which ends in .csr) to a certificate authority, such as Comodo Group, Inc., Thawte, Inc., or VeriSign, Inc.. Just upload the file or copy and paste into the authority’s website. The certificate authority sends you a signed certificate. Locate the files containing the certificate and the matching private key in the Finder and then position the folder’s window in a place where you can get to it. In the Server app, select your server in the left column, select the Settings tab, and click the Edit button next to SSL Certificate. Click the Actions menu and choose Manage Certificates. A new dialog slides down. 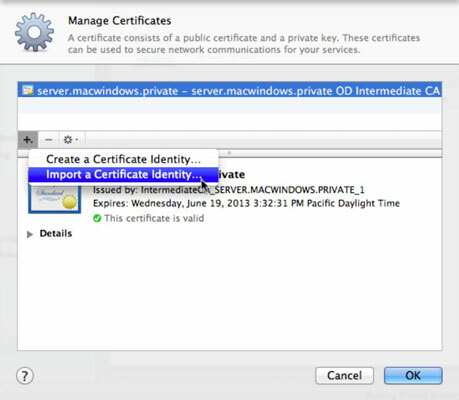 Click the Add (+) button and select Import a Certificate Identity from the Actions menu. Drag the certificate and private-key files from the Finder to the dialog and then click the Import button. Choose your imported certificate from the pop-up menu.